A perfect fit for your sport or touring bike, the Bridgestone Battlax BT45 tires provide performance and great mileage. With a large crown radius, long lasting center compound and softer side compound you can corner with confidence. Quality motorcycle tire at a reasonable price for your ride. 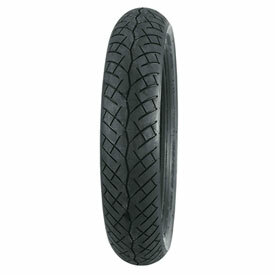 Bridgestone Battlax BT45 V-rated bias ply motorcycle tire, designed to give performance and mileage on sport bikes. Bridgestone Battlax BT45 H-rated bias ply motorcycle tire, designed to give performance and mileage on today's sport-touring bikes. Larger crown radius for greater stability and longer motorcycle tire life. I was expecting a hard, numb touring tire when I bought these BT45's for my Concours C10. However they are actually quite a sporty tire in disguise. They grip well, have decent tread life, and communicate well. The profile is obviously more touring oriented, but they work well regardless. They provide the stability necessary on heavier bikes. Just replaced the D404 (front) and ContiMileage (rear) on my 06 Concours with BT-45Vs (110/80 & 150/80). The difference is unbelievable. Steering is light, quick and stable. There is no tendency to fall in or push when entering or exiting a corner. Tracking is great with respect to rain grooves and cracks in the road, although Iâ? ?ll have to wait and see how they respond with more mile on them. If I can get 8 â?? 10K miles out of the rear, then these are the tires Iâ? ?m going to stick with. I purchsaed this tire for my 1991 Honda 750 Nighthawk. Good looking tire. Great tire for the money. The BT45 110/80-18 58V is a decent replacement for the Dunlop K505F. Fit and ride are great. This was my fist time ordering tires online. Only concern I had was the freshness of the tire. I ordered beginning of August 2010, the tire has a date code of 1410 (April 2010). The tire is fresh. wears good and grips good too. Great product.